Betty Mc is a 45′ “crayfish” boat, typical of many fishing craft from south eastern Australia built throughout the 1900s. Early boats were all sail and as engines improved, sail rigs shrunk. 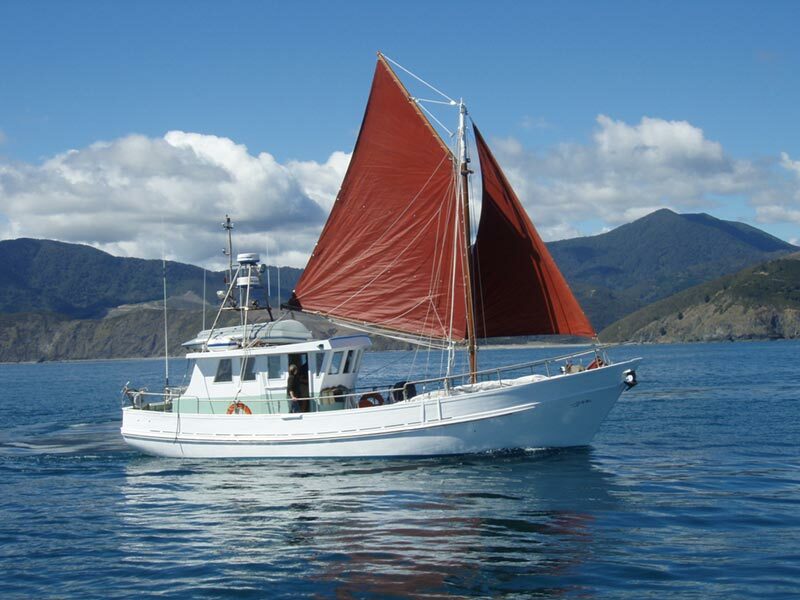 Betty Mc is one of the last era of boats to retain a sail rig. She was built in 1963 by Ken Lacco for his son Snow, who began fishing in 1964 in Victorian and Tasmanian waters. She was fishing commercially until 2001 when we purchased her. We refitted her for “spartan” long-distance cruising in 2006 with the removal of deck machinery, a new engine, transmission and genset, and a larger wheelhouse. All holds were retained, including the 6m3 “wet-well”. In 2007 she left Australia, visiting New Zealand, many central pacific islands, Micronesia, Japan and the Aleutian Islands arriving in the Pacific Northwest in 2011. Following several seasons between Vancouver and Kodiak she travelled south down the west coast to Mexico and through Central America as far as Costa Rica. She is carvel planked in Celery Top Pine on laminated frames of Yellow Stringybark with a keel and keelson of ironbark, all common Australian timbers for commercial craft.